Hola Mohalla is a festival of Sikhs which is celebrated a day after Holi. The festival falls on the first of the lunar month of Chet and takes place in the month of March. Guru Gobind Singh, the tenth guru of Sikhs, on March 7, 1701, started a new tradition by overseeing a day of mock battles and poetry contests at Lohgarh Fort. The tradition of organising mock military drills by Khalsa Army spread from the town of Anandpur Sahib to other Gurdwaras. After the mock drills, colours were thrown by the participants. 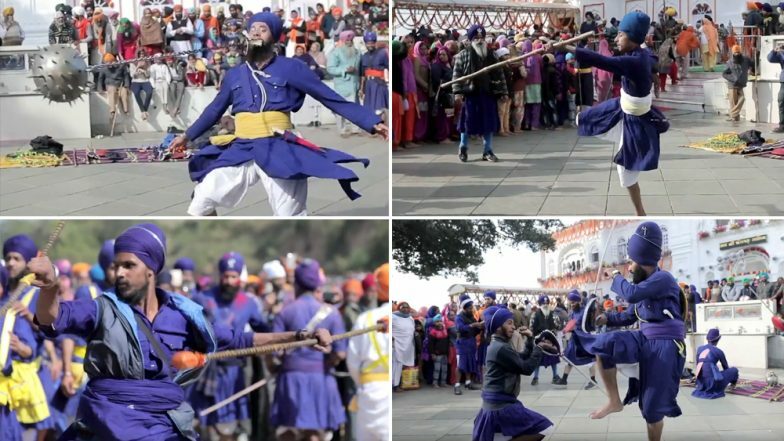 Hola Mohalla 2019: All About the Festival Celebrated After Holi that Showcases Military Skills of Sikh Warriors. Word ‘Mohalla’ means an organised procession in the form of an army column. On the occasion of Hola Mohala three-day fair is organised every year at Sri Anandpur Sahib. Mock battles, exhibitions and display of weapons are held followed by Shabad Kirtan. Pilgrims are also served langars. The festival depicts the bravery of the Sikh Community. Holi Recipes 2019: How to Make Gajar Ki Kanji? Easy Steps to Prepare This Healthy and Tasty Fermented Beverage With Black Carrots. Deh Shiva Bar Mohe hai: The song is dedicated to all the Sikhs who sacrificed their lives for the truth. Sikhs ask God to give strength to fight the evil. Hola Mohalla Baja Wale Da: This song depicts how the Hola Mohalla is celebrated in Anandpur Sahib and also hailed the tenth Guru, Sri Guru Gobind Singh Ji for creating the Khalsa Panth. Singh Sava Lakh De Barabar: This song hailed the bravery of Sikh religion. This song depicts the sacrifice of Sikh community in fighting injustice. Dumaaliyaan Wale: The song showcased the martial skills of the Nihangs. They are the members of the Khalsa army known for their distinctive blue traditional robes and decorated dumalas. On this festival, pilgrims gather in large numbers at Anandpur Sahib to witness a very impressive and colourful procession of Nihangs who are the members of the Khalsa army known for their distinctive blue traditional robes and decorated dumalas. The martial arts exhibited by the Nihangs display their skills and traditions to the visitors.